I did an informal talk at HLC on Sunday, March 7th, discussing the new work on exhibit. This lecture was filmed and edited by Adrian Aquilino, and is presented in three parts. Enjoy! 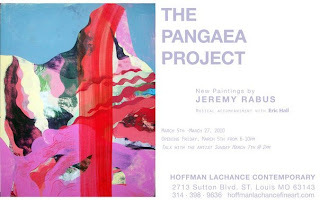 "The Pangaea Project" at Hoffman LaChance Contemporary from Jeremy Rabus on Vimeo. "The Pangaea Project" at Hoffman LaChance Contemporary (2) from Jeremy Rabus on Vimeo. "The Pangaea Project" at Hoffman LaChance Contemporary (3) from Jeremy Rabus on Vimeo. "The Pangaea Project" is on exhibit through March 27th at Hoffman LaChance Contemporary.